We’re also big fans of transparency. As in: What you see is what you get, and anything we get from our generous sponsors and/or donors you’ll be able to clearly see put to work for the benefit of local trails, and beyond. This is the page wherein you'll be able to find various options for traveling along with us: In person, in spirit, and in checkbook. We'll need funds for copious amounts of caffeine and various travel expenses, yes, but more than that we use donations for trail work parties (and trail work tools), trail advocacy, trail clean-up, and outdoor education, as well as to partner and collaborate with some of the best and most hardworking outdoor organizations centering on issues near and dear to our hearts, and hopefully near and dear to yours, too. 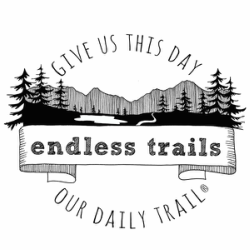 If you know of, or are involved in, a charity/non-profit/outdoor org you think would fit within Endless Trails' mission and scope, we'd love to talk to you. To see who we're already working with, please visit our Sponsors/Partners page. You'll find them all there, along with our heartfelt gratitude. We're looking for monetary donations, of course, but also for volunteers and cheerleaders of any kind who want to stand on metaphorical and physical corners with metaphorical (and, sure, physical) pom-poms for us and all sorts of trails. ​(AND MAKE OUR DAY IN THE PROCESS)? We’d love it if you did. And, as a registered 501(c)3 non-profit, any and every contribution you make to Endless Trails – be it monetary, or via a donation of goods and/or services – may be entirely tax-deductible. * We call that a big win-win. Donations to be used for Outdoor Education curriculum-building and outreach, as well as for art/nature journaling supplies for youth and adults. Donations for specific trail work projects. If you'd like to support a specific project, please let us know--we can make sure to allocate your support to the project of your choice. ​Donations used to cover the cost of registration fees for a Wilderness First Aid course taught by the Seattle Mountaineers. Donations to cover the cost of an extensive and game-changing Wilderness First Responder course we took and completed in Spring of 2016 and a subsequent recert program in Fall 2017. $2,000 in donations from 2017's Sharlie Shuffle that went directly back into Idaho State Parks for trail work tools, trail creation and updates, and Outdoor Education programs for a variety of trail user groups. A recurring monthly donation. These can be made in any dollar increments, and can be discontinued at any time. No contracts. No obligations. Just heaps of gratitude. A donation to support a specific trail work party. A donation to support an upcoming Endless Trails race. A donation to support a specific upcoming Endless Trails project. We'll be perpetually announcing more exciting trail work dates and projects, so stay tuned! *We're a registered 501(c)3 non-profit, so donations made to Endless Trails are tax-deductible, but all tax deductions are of course based on your specific tax situation and the amount of annual donation(s). We'll send you a receipt for every donation, and you should keep those alongside your tax records. WE'RE LOOKING FORWARD TO WORKING WITH & ALONGSIDE YOU! We've a great undertaking ahead of us, and we couldn't be more excited to see what we, as a local and global community of inspired humans, can do for one another, and for our beloved outdoor spaces. If you / your company / your family and/or friends / your running club / your favorite coffee shop, or anyone else are interested in supporting Endless Trails via any of the avenues listed above, or in any other way, please send us a message using the contact form below! Have an idea for how we might work together? We'd love to hear it!